Do you know Tea of the People? They are a socially conscious tea company offering healthy tea blends created with as many antioxidant rich ingredients as possible. They focus on real ingredients, not just added flavorings. They are hoping to make a difference by donating a portion of profits to entrepreneurs and non-profits that are helping make the world a better place. I was intrigued and wanted to find out more. 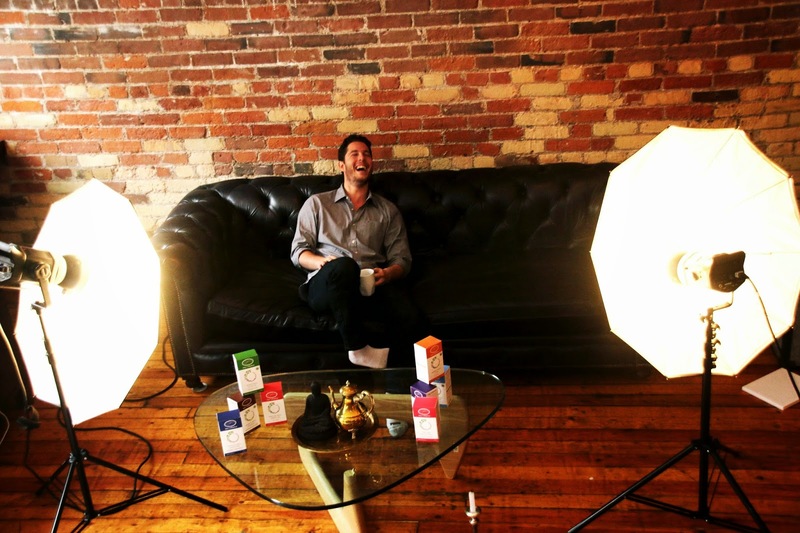 Founder and Chief Activist Officer Joshua Caplan kindly agreed to answer some questions so we can all learn more about Tea of the People. Here is our interview! Describe why you decided to start Tea for the People. How are you changing they way consumers drink tea? Tea of the People was started after an important discovery; tea drinkers everywhere could be getting so much more out of each cup of tea. After diving deep into the different types of tea and flavouring techniques, I realized the vast majority of tea we drink is poor quality and inauthentic. Take a look at both the box of grocery store green tea and “premium” loose leaf tea in your cupboard and search for the name of the green tea. Only 10% will the packaging state what type of tea it is and the reason is because you aren’t supposed to know. Secondly, the harsh flavouring sprayed onto the tea leaves has zero nutritional benefit. That pomegranate green tea you are drinking? Again, it’s very unlikely any pomegranate arils are in the blend. Tell us more about the company values. Like our packaging states, Tea of the People is a different kind of company. Our body is one of a for-profit and our soul is that of a non-profit. Our higher purpose manifests through unique approach to corporate social responsibility. We support both entrepreneurs & non-profits with technology centric solutions to issues such as poverty alleviation, education and climate change. As a sustainable business, we are a carbon neutral company and collaborate with suppliers, vendors and customers to be more “green”. Who creates the blends and what inspires the creation of each blend? All our innovative teas are hand-blended. Our inaugural line-up took months upon months to perfect. Our inspiration is whatever is healthiest. For example, when seeking out green teas, we sought the most antioxidant green tea in the world dragon well, and blended it with goji berries, a super fruit with 500 times more vitamin c than an orange, by the ounce. We created innovative teas that were over the top in health benefits, uniqueness and flavour. Two important questions were asked along the way: has this been done before and can we do it in an honest way, by using real ingredients. I see you offer barrel aged teas. What are the benefits of barrel aging? Barrel aging tea is new and exciting way to enjoy tea. Barrel aging tea comes the tea a more complex, robust and sophisticated flavour. Recently, Food Navigator wrote a piece about our company and barrel aged teas. The story had legs and so much so, that we were invited to speak at the American Food & Technology Summit in Chicago, Illinois. What non-profit organizations does the company currently support? November was Khan Academy, which provide "a free, world-class education for anyone, anywhere” by producing micro lectures in the form of YouTube videos. Supporting Medic Mobile is our higher pose for December. Medic Mobile is, a non-profit dedicated to bettering healthcare in the developing world leveraging SMS technology. Our Organic Barrel Aged Silk Road Chai is one of our best sellers. We had Toronto’s leading food personalities & experts try it and the feedback was incredible. Serious chai drinkers have told us this is their favorite of any chai they have ever had. Our Acai x Goji Dragon Well green tea is another huge favorite. Because the blend is loaded with Goji, it makes for a mouthwatering and authentic taste. It makes for a delicious ice tea, as well. When did you discover your passion for tea? The sheer quantity and aromas reeled in me. But another reason I took up tea was because I was not aloud to drink coffee. The caffeine, as told to me by my mother, would stunt my growth. Thank you so much to Joshua for the interview! ​I have two teas from Tea of the People to review, so stay tuned! If you have any further questions for Joshua, please leave them in the comments.